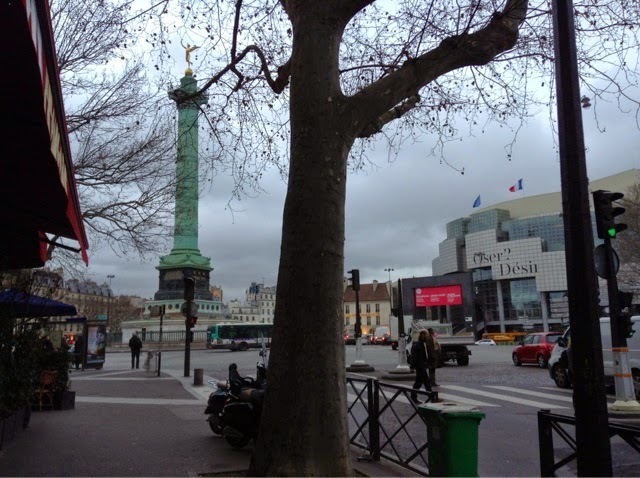 Yesterday in Paris it was 40 degrees, grey and drizzly. 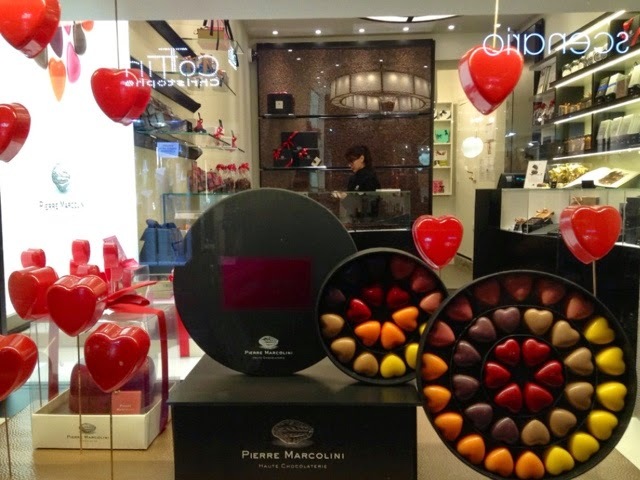 I went out looking for Valentines goodies to put in the February Paris Sketch letter. Found some doozies including French recipe cards, very excited. 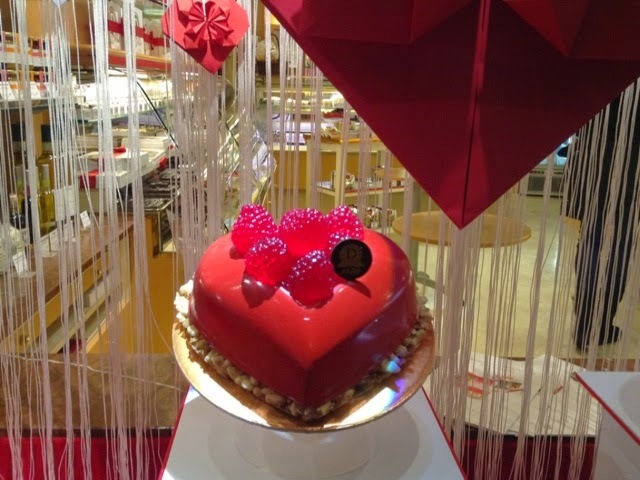 This stunning cake is in Dalloyau's window. 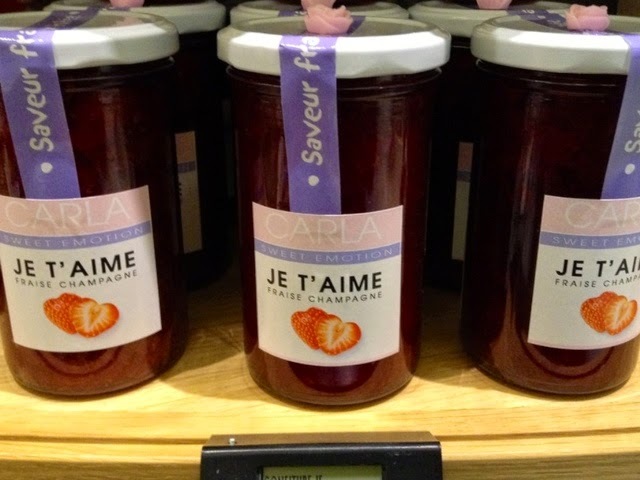 Le Grand Epicerie has Love jam waiting for you made of strawberries and champagne! 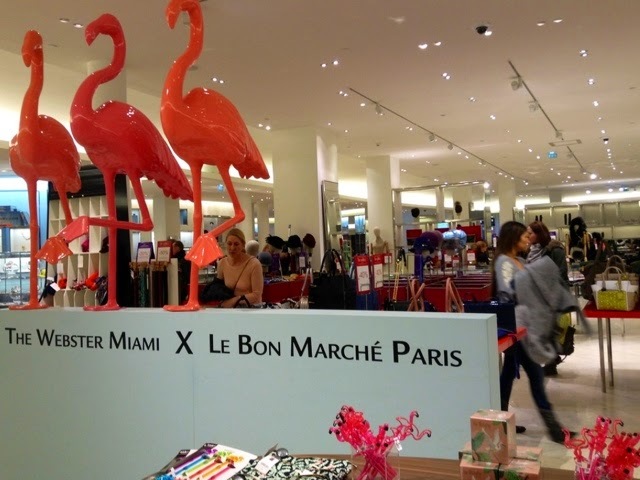 Next door Bon Marche's windows are full of pink flamingos, some dropping their shorts...ahem. They have a promotion with The Webster Miami. Who knew? Pink flamingos everywhere. 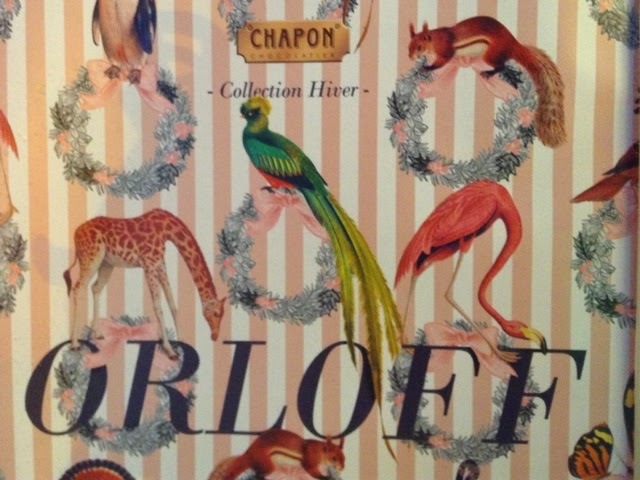 On rue du Bac, chocolatier Chapon is in a flamingo state of mind. Is this little French girl getting ready for Saint-Valentin? Next door an over-the-top love birds window. The day before yesterday, I left the house at 8:00 AM to join cooking teacher Charlotte Puckette at her marche Grenelle by 9:00 AM. We had a ball. 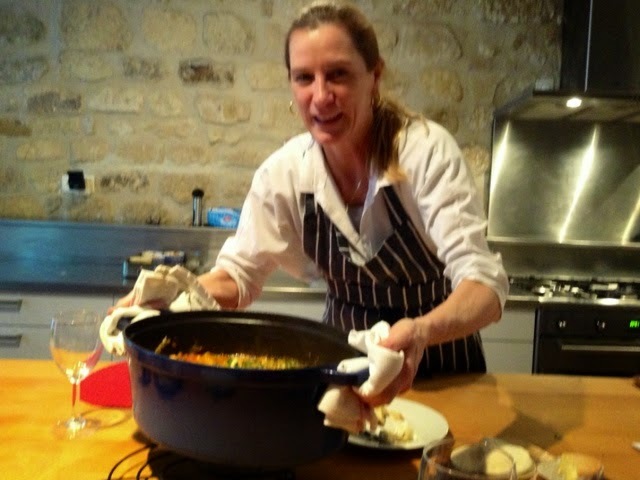 Charlotte knows what every cow, goat and sheep in France ate for breakfast. And why and when you should buy their cheese, milk or meat. 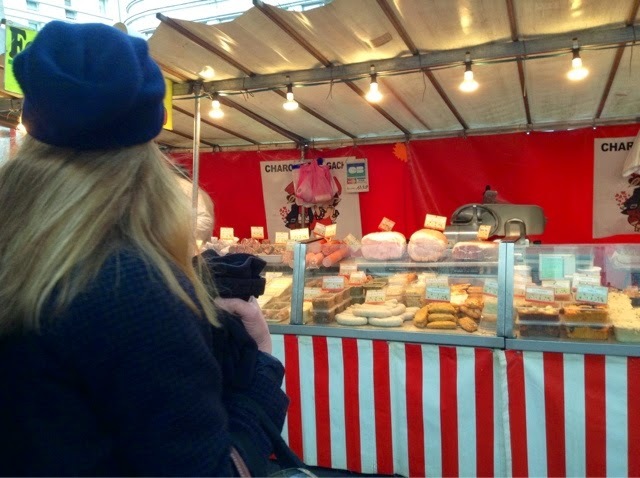 Pretty impressive visiting Paris markets with her. 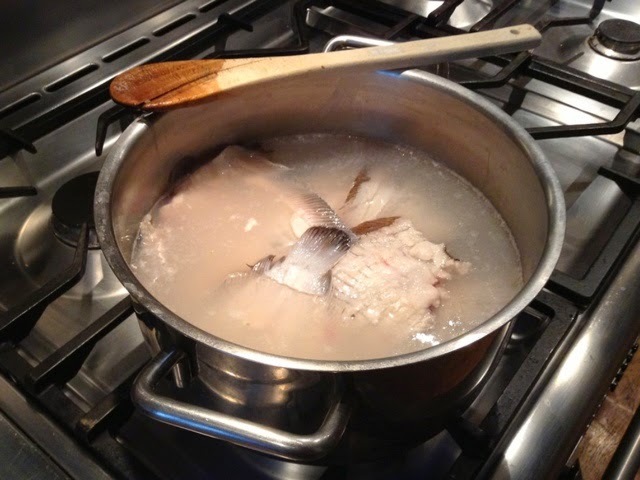 Then we made a fish 'bone' broth, which by the way is the new hot, hot food for 2015. Alert: bone broth of any species is IN PBers. Throw out your bouillon cubes. Run to the butcher. More to come. 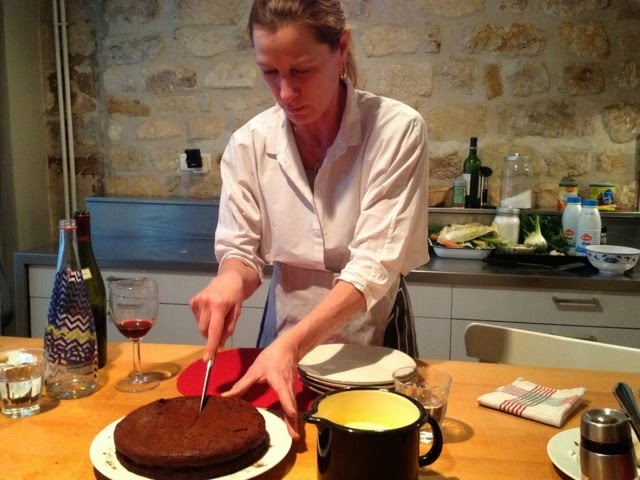 Check out Karen Wheelers book on what Marie-Antoinette ate. M-A was a big bone broth eater. 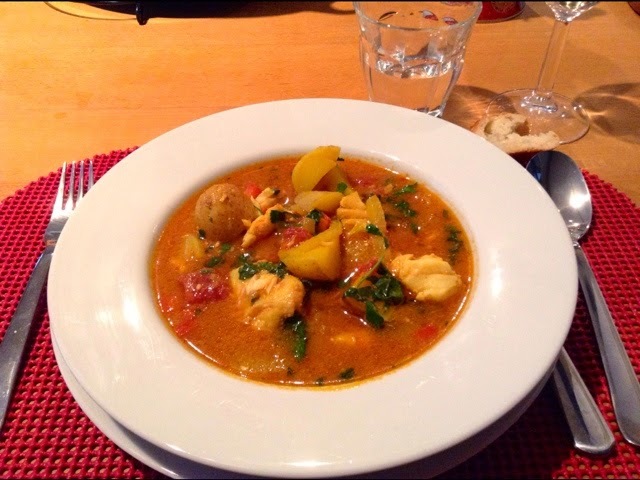 This gorgeous Tunisian fish soup from Charlotte's The Ethnic Paris Cookbook (page 30). Followed by a chocolat fondant with crème Anglais. More to come on cooking with Charlotte Puckette and bone broth soon, I promise. 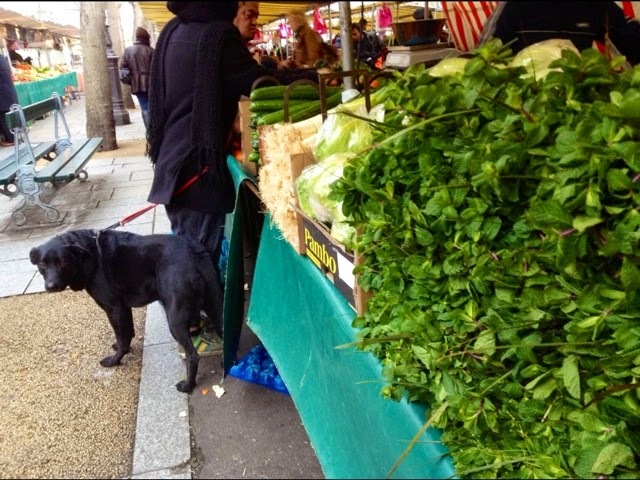 Yesterday I was inspired to get up early and go out to my own marche Bastille by 9:30. Yahoo. Every Thursday/Sunday I have the best of intentions and never make it. But Charlotte has shown me the way. Visiting Paris' marches is an upper better than pills or sun lamps. Full of color, conversations and enticing smells. 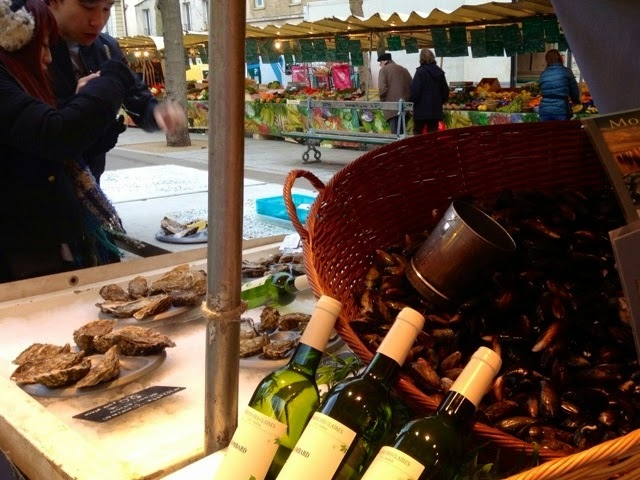 A Don't-Miss in Paris and Free. These early birds share freshly-shucked oysters. Do go before the crowds ascend. Alert: there are new bus shelters going up all over town. They must have elves working at night. Another Alert: I got invited to Opening Night at the Brussels Salon du Chocolat - an opp not to be missed. More to come on this. 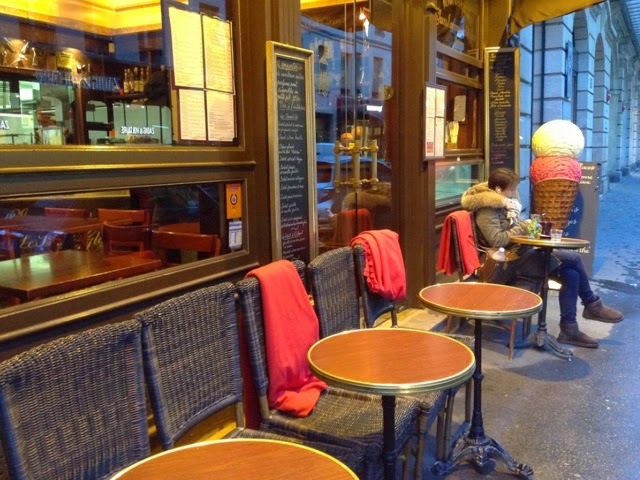 Love the cafe-goer sitting next to an ice cream cone and rosey blankets. I have a lovely chicken carcass waiting to be made into a broth this morning. I have to agree with you wholeheartedly..vising a market is such an upper. In Spring..summer and fall here..it is one of my most favorite outings. And I love your fondant..and the little girl. 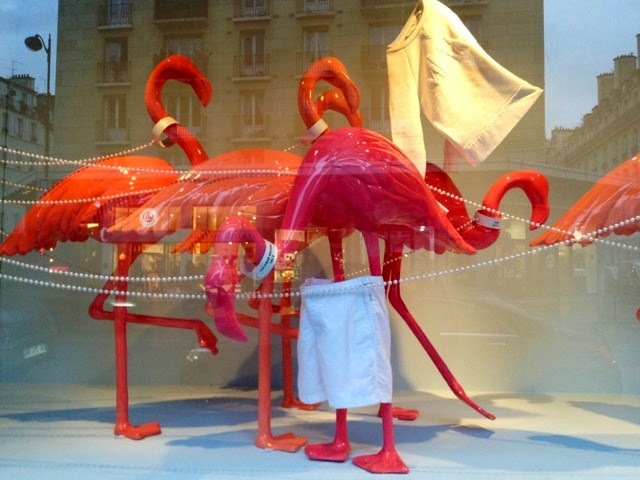 So funny - the flamingos with the dropped drawers! 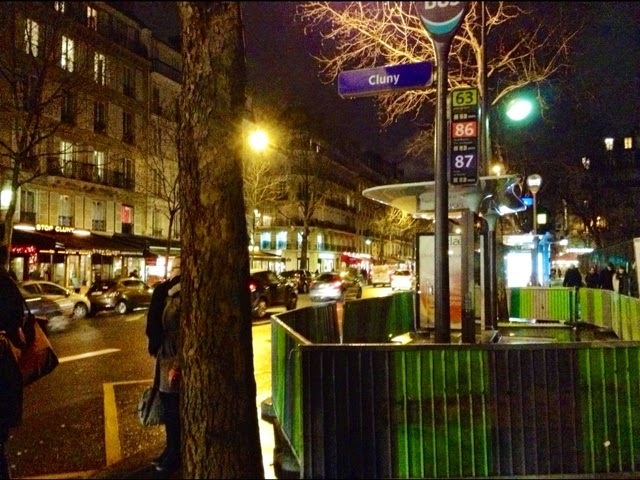 I thank you for your generosity and beautiful Spirit in providing me with a bit of Paris every week. It is precious and I love the opportunity of being there with you. Love the brave soul sitting next to the ice cream cone. Thank you for your wonderful entries! 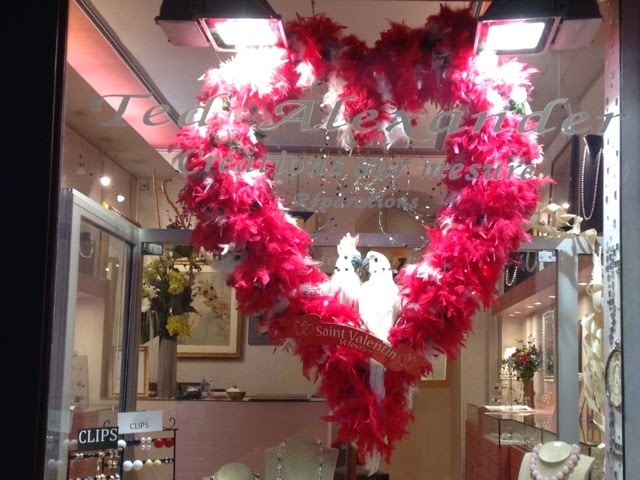 Love your blog, love all that red red red in all the wondrous windows, and the Love it implies. oooh, that looked fun around the rue du Bac, even if it was on the chilly side. Sure beat battling the snow off my groceries - it was so wet in the outskirts - you have the same? 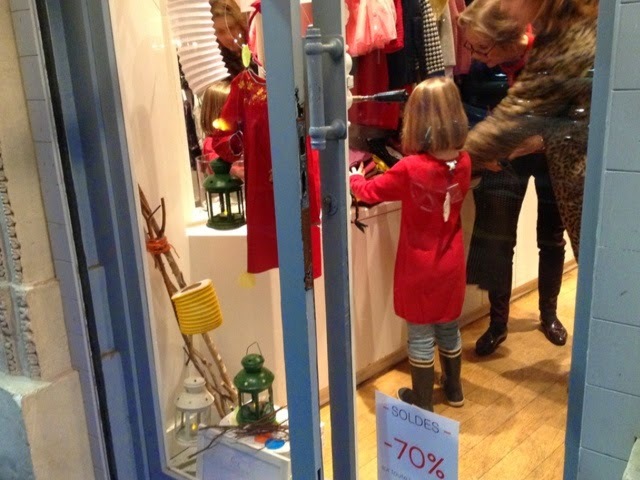 Trust you to see the romantic side of Paris with the red dresses. Lovely! Is there any chance we could have the fish soup recipe?????????? I added the Amazon link in the post Bev. will send you a link to Marco Canora in the NY Times. e lives in our building and is a chum. You are kidding Elizabeth ! The NYTimes link is in the post. I am ready to move back to NYC to get bone broath! Terrified of asking a butcher for bones...the whole darn thing mystifies me. I'd give the bone broth a try - that Tunisian soup looks delicious. 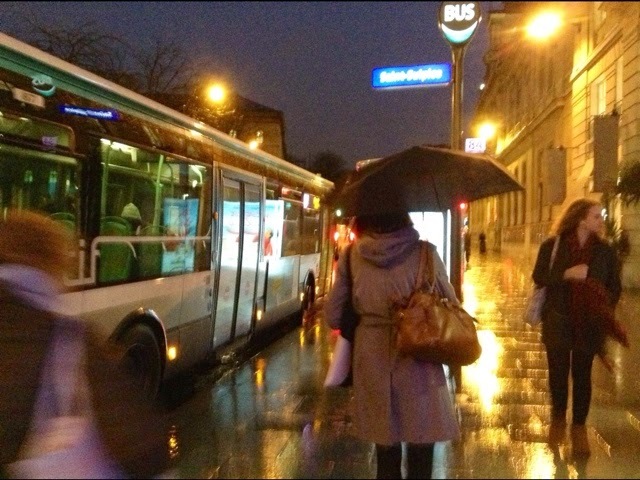 My favorite part of the post are your outdoor photos; the bus at twilight, the bus shelters and the markets. Great photos! The soup looks delicious, love your fondant sketch & can't wait to go to the Bastille marche - it's added to my list as we will be very close. I've been making bone broth all winter, every week and drinking it by the cupful everyday. No colds, coughs, flu or even a sniffle.What's old is new again because it works! I save veggie trimmings and spare bones in a bag in the freezer, then hit the butcher up for some bones....they are getting a bit pricey..then toss all in my crockpot and go off for the day. when I come home, I drain the broth through a sieve, toss in the fridge, then scrape off the fat. a cup warmed in the microwave or on the stove is just wonderful.Best batch was with a smoked turkey carcass from Thanksgiving! I read your blog often but do not comment. This time though, reading that you were invited to the Brussels Salon du Chocolat, really made me jump. What a wonderful opportunity. I’ll look forward to your comments – Belgian chocolate is outstanding. When I am in Paris I always try to take the TGV to Brussels for a quick chocolate fix! It's been so long since I've visited Brussels and was longing to go. Brussels chocolat hot chocolat mit schlag oh Yum! You create a wonderful story with pictures and give the imagination great images to enjoy..
"Throw out your bouillon cubes! Run to the butcher! I couldn't agree more. Bone broth is wonderful stuff. 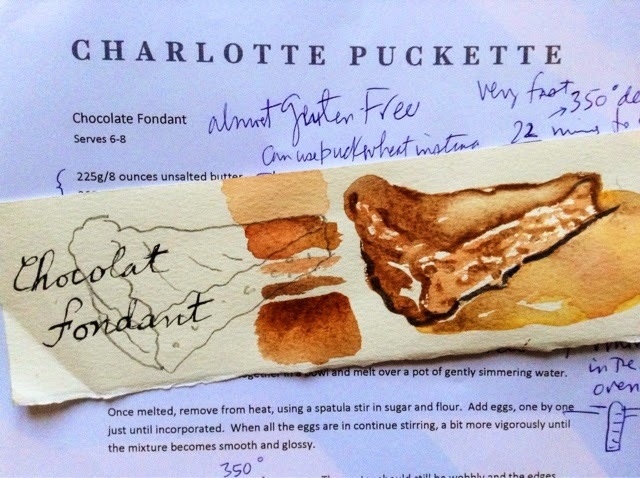 The fish soup looks gorgeous by the way – will check out Charlotte's book. Beautiful post as usual! The Lettres arrived. I love them! Isn't that just like an American to get an invite to Paris and drop his trousers, ruining it for the rest of us!